Obituary for Arlena "Maxine" (Baughman) Allen | Cromes-Edwards Funeral Home & Crematory, Inc.
ARLENA "MAXINE" ALLEN of Sidney passed away at 8:45 p.m. on Saturday, October 27, 2018, at Ohio Living Dorothy Love. She was 95. Maxine was born on March 30, 1923, at the family home east of Jackson Center, OH to the late Kenneth and Iva (Kies) Baughman. On June 3, 1944, she married Elmer F. Allen, who preceded her in death June 17, 1998. She is survived by two sons, Larry (Ann) Allen of Sidney and Dan (Polly) Allen of Maplewood. She is also survived by six grandchildren, Mike (Janie) Allen of West Chester, Lynn (Scott) Haman of Columbus, Mark (Lindsey) Allen of Plain City, Chad (Jackie) Allen of Sidney, Seth (Kim) Allen of Zanesfield, and Luke (Kristin) Allen of Sidney. Maxine also had three step-grandchildren, Jost (Maria Lavender) Zwiebel of Texas, Jeremy Zwiebel of Marysville, and Katie (TSgt Dustin) Withrow of North Dakota, as well as 27 great-grandchildren and many nieces and nephews. All will remember that twinkle in her eye and miss her dearly. Siblings preceding Maxine in death were one sister, Eileen Kempfer, and two brothers, Ralph and Chester Baughman. Upon graduation from Jackson Center High School, Maxine began work at the Jackson Center Creamery, making ice cream. That influence clinched orange-pineapple as her favorite flavor forever. After marriage she became a homemaker for the rest of her life, a role that suited her perfectly. She was also secretary for the Shelby County Soil and Water Conservation District for 32 years. 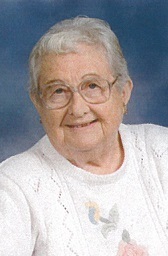 She had been a member of the Sidney First United Methodist Church since 1944. She was a devoted Sidney High School football mom. She was a member of the Olivia Circle, PERI, Shelby County Farm Bureau, Sidney-Shelby County Senior Center, Tar Hollow volunteer, United Methodist Women, and Paws for Jesus dog trainer. She was a 4-H advisor for a total of 67 years for the Sow and Grow Club and PawPrints Dog Club and was honored during the inaugural year of the Shelby County 4-H Hall of Fame. Maxine had a great fondness for dogs, operating the Allendale Kennels for many years with Toy Manchester terriers. "Grammie" enjoyed spending time with her family at the farm. She looked forward to family gatherings and special occasions. She loved to cook-for her large family, for the Alpha Center, and for church dinners, picnics, and carry-ins. She was known to have meals ready to go from the freezer at a moment's notice. Grammie could make things last forever. She recycled and repurposed. The impact of the depression era was not lost on her. Maxine had many friends and loved a good visit. She especially enjoyed playing dominoes and showed no mercy to her opponents. She had an ongoing war with the weeds in her vegetable garden and flower beds, and continued to can and put up her produce. On the go constantly, her days were filled with service to others: making apple dumplings at the church, working the fair gate, volunteering at conservation camp, baking cookies for blood drives, and so much more. Her legacy is the memories that she made with us and the stories she shared. God has certainly provided her with a green pasture where she can finally rest among the sheep of His flock. Well done, my good and faithful servant. Welcome home. Funeral Services will be held Friday, November 2, 2018 at 10:30 AM at Sidney First United Methodist Church, 230 E Poplar St, with Rev. Dr. David Chivington officiating. Burial will follow at Pearl Cemetery in Swanders. The family will receive friends on Thursday from 4 to 7 PM at Cromes-Edwards Funeral Home, 302 S. Main Ave, and on Friday from 10 AM until the hour of service, at the church.